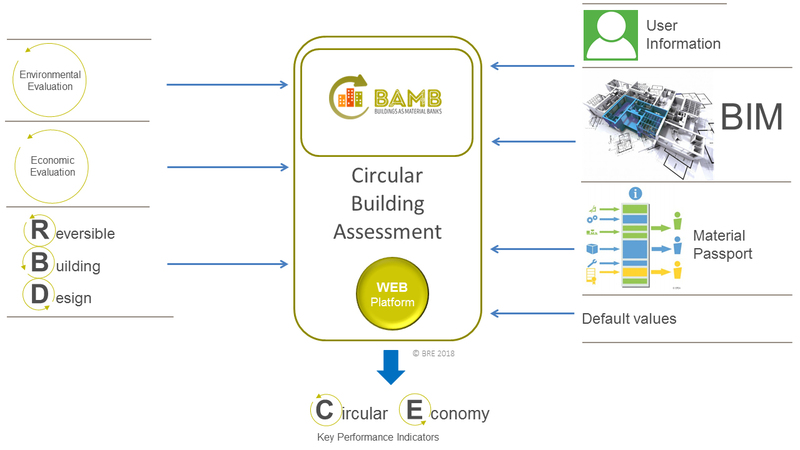 Here you will find a summary about the ongoing technical developments of a user friendly and pragmatic tool for assessing circularity in buildings with varying levels of data and design stage. 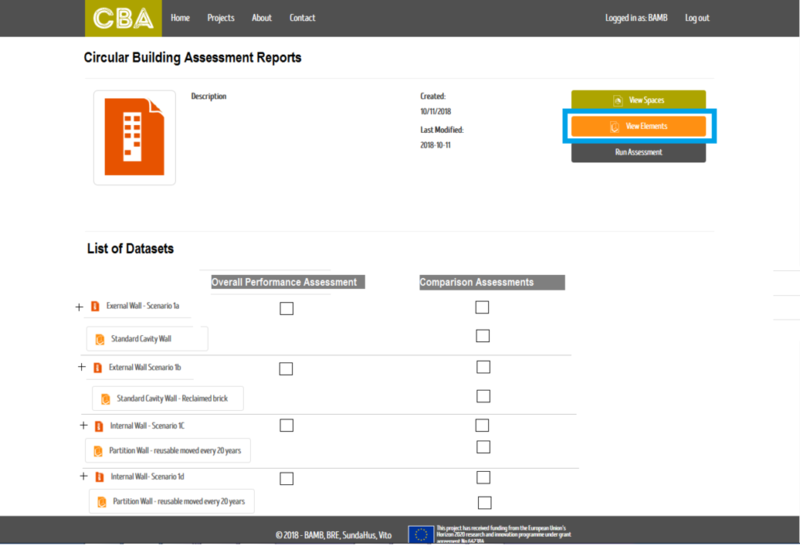 BAMB Circular Building Assessment, referred as CBA, is a methodology that compares and assesses product and material resource flows during the life time of a built asset and beyond. This method is being developed into a prototype online platform/tool that can quantify and compare design approaches, focussing on the difference between ‘business as usual’ versus circular building scenarios. These include reusing from the previous built environment, designing for future reuse via reversible building design, and the potential to transform, highlighting the corresponding environmental and economic net benefits. The CBA methodology has been set out consistently to enable exchanging of attributes based on ISO 16739 [Industry Foundation Classes, IFC] which is the backbone for communicating BIM data. The data acquisition aspect of CBA is crucial to reducing the amount of data that needs to be input by the User (Figure 1 illustrates how information will be sourced to do the CBA assessment). The platform will allow the users to upload a COBie or information exchange file generated from authoring software (e.g. Revit, ArchiCAD, Sketchup) used to create a BIM model. The platform can then automatically extract from the model: quantity data input by the user, relevant bill of quantities and material data for the assessment. Where there are data gaps, a series of webservices are being developed to pre-populate information, such as material density and reversibility of connections, which the user can review and edit. 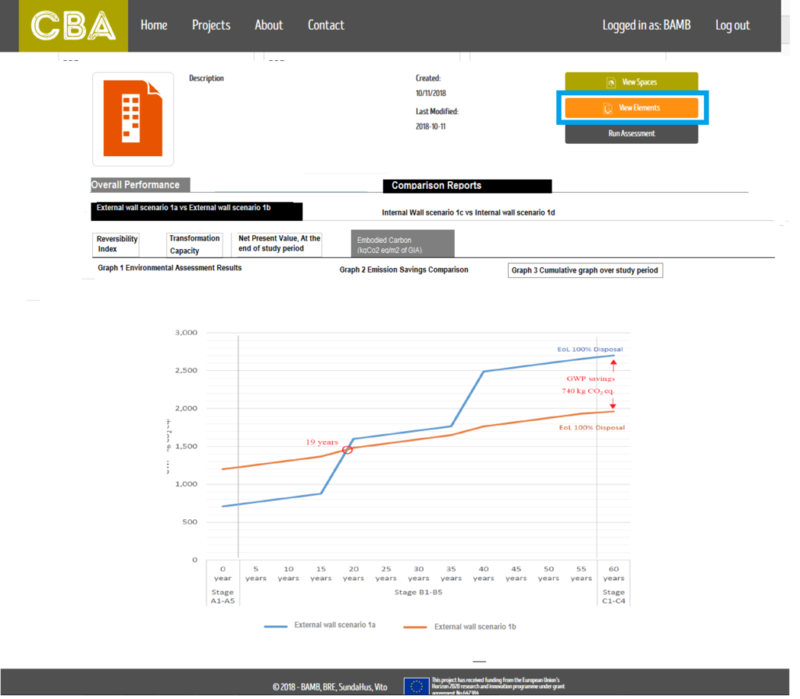 The data input (BAMB information Requirements) needed to undertake the CBA assessment will then be converted into a series of BAMB templates using BRE’s data Templater software (See http://www.bretemplater.com/). This schema communicates the additional BAMB properties in a neutral way in order to extend any software that allows ‘extensions to its parameters’ (see Figure 2 and Figure 3). Image 2. 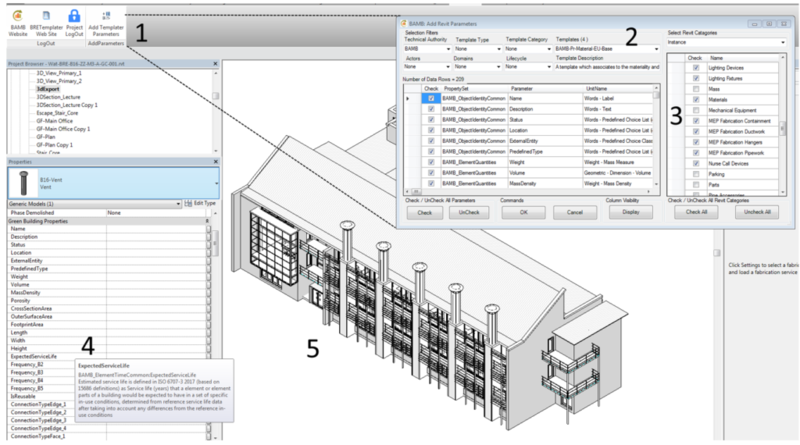 Screenshot of revit object with assigned properties. Human readable descriptions for each property are brought through and if supported by the software can be displayed. Image 3. Screenshot showing sketchup object with assigned properties. Applied via the sketchup plugin toolbar. 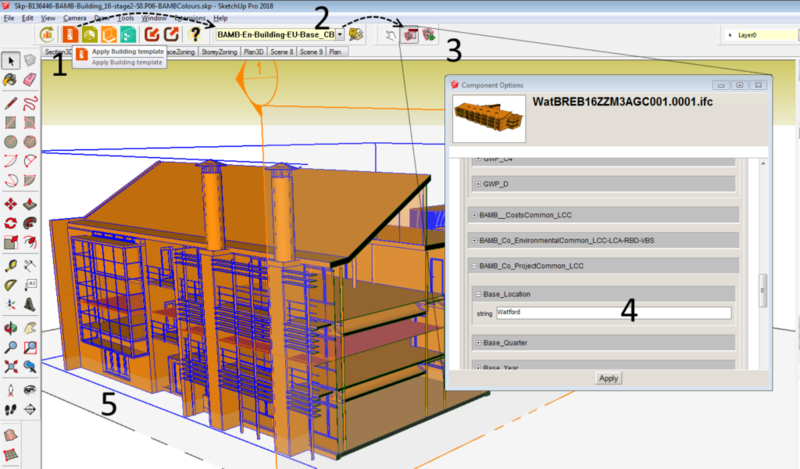 The BAMB Information Requirements provide a placeholder within the BIM model for data to be stored against them. 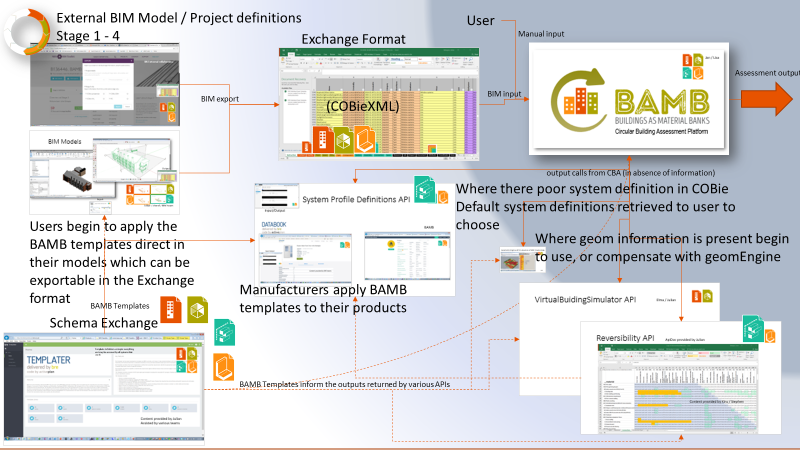 This is also accompanied with relevant mapping files that enables the export to IFC and COBie or a tailored implementation the project refers to as ‘BAMBie’ that details more on the material level than a typical COBie exchange might provide. The platform will then uses this information exchange format to recreate a BAMB data model on the platform automatically and then perform CBA calculations. (See Figure 4 and Figure 5 for comparison of results for one of the pilot projects). The CBA user platform and core elements of the overall system are currently undergoing validation using the BAMB pilot projects. Ultimately, the CBA platform will provide a truly practical circular building evaluation approach, starting at early design stages and expanding with granularity of information as a project progresses into detailed delivery phases. Through this, BAMB is developing a proof of concept that clearly demonstrates the ability to develop multiple design options and assess rapidly in a semi-automated environment, utilising data from Building Information Modelling, where available, or providing a foundation of assumed data where it is not. IFC – Industry Foundation Classes – (IFC) data model is intended to describe building and construction industry data. It is a platform neutral, open file format specification that is not controlled by a single vendor or group of vendors. BAMBie – Buildings as Material Banks Information Exchange; a way for users to communicate the information required for the CBA. Similar to COBie Its written in a machine-readable language that has advantages for web platform interaction.